It appears that Windows Media Player 12 for Windows 8 is not only loosing its DVD playback feature, but also its built in media store, including the outdated and useless Media Guide. Media Guide for Windows Media Player was an online Media Store that started to be integrated to Windows Media Player with Version 7, introduced alongside Windows ME 12 years ago! It was part of Microsoft’s then online media Strategy, branded as “Windows Media” with its newly launched website, http://windowsmedia.com. The media store has seen some improvements during the Windows XP era but very little during the Windows Vista Era. With Windows Media Player version 10, Microsoft added the ability to have third party online media store to be integrated alongside Media Guide. They could also create special links in the specialized store toolbar. In Windows Media Player 10, there were multiple default stores out of the box with Media Guide. Users could switch between the stores easily. Windows Media Player 11 left the feature intact but didn’t improve much upon it. By the time Windows Media Player 12 was released in 2009 with Windows 7, it was clear that Microsoft had no strategy with Media Guide. The site stalled, left as is. Sure, there were new music and videos added to the site, but other than that, the site remained stuck in its Vista days. In fact, you can visit the website today; you will see new featured music and videos, but the site will bear look of the Microsoft websites in 2007. Windows Media Player 12 in Windows 7 kept the ability to access media guides and third party stores, but removed the specialized toolbar. It seemed as if it was left to rot. Microsoft had another media strategy at the time: zune. Three years later, with the launch of Windows 8, it seems that Microsoft is finally pulling the plug on Media Guide, a 12 year old online media strategy. In Windows 8’s version of Windows Media Player, there is no Media Guide. Media Guide and other third party stores are no longer integrated in Windows Media Player. As you can see in the screenshot below, there is no store in Media Player in Windows 8. This marks the end of Microsoft’s attempt to integrate an online store with Windows Media Player. Instead, Microsoft integrated a media player to its online store by introducing the Zune player. Today, Microsoft’s online media strategy is Xbox. 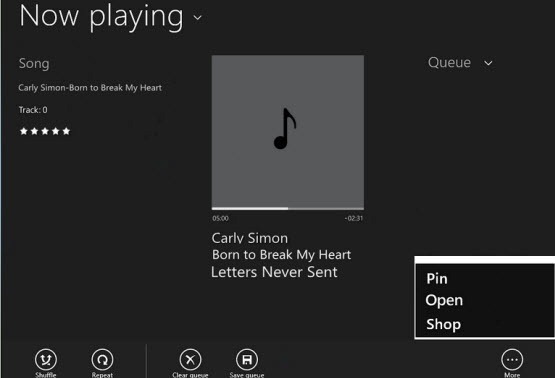 Rather than putting Xbox music and video in Windows Media Player, a music and video player is added to a Xbox Music and Video Store app. Same goal, but the reverse way of doing it. This probably highlights that Microsoft want to focus primarily on the Store experience and make media playback (local) a secondary experience on top of the store.